Jalapeños are pretty much a nonnegotiable ingredient for cooking à la Rachael Ray — leave it to her to make poppers a vital step for dip, mac and cheese, sliders, and basically anything you'd want to be delish. 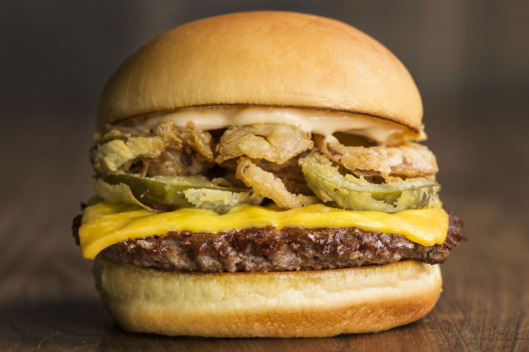 So, naturally, Shake Shack is making them the star of its newest limited-edition burger, created to celebrate a decade of Every Day with Rachael Ray. The Pickled Jalapeño Burger comes topped with cheese, crispy marinated shallots, deep-fried Gordy's Thai basil jalapeños, and Sriracha. It's available only at the Dupont Circle location in D.C., from October 13 to October 18. Nowhere near the Beltway? That's cool, says the Shack — the full recipe will be printed in the November issue of Every Day.